SHALE OIL is the standard fuel for locomotives in Estonia and makes for economical working. Above is a 2-8-0 engine, one of the some hundred locomotives in operation on the narrow gauge lines. Many of the locomotives in Estonia are of Russian origin. Saaremaa (Ösel) and Hiiurnaa (Dägo). As the country is part of the Great European Plain it does not present many difficulties to the railway engineer. The total area is 18,370 square miles and the population at the census of March 1, 1934, was 1,126,413. Most of the people live in rural districts and are engaged in farming; even a third of those engaged in industry reside in the country. Less than thirty per cent live in towns, and of the eighteen towns ten have fewer than 10,000 inhabitants. About nine-tenths of the people are Estonians, most of the other tenth being Russians, with Germans, and Swedes forming the remainder. The railways, confined to the mainland, are of two gauges, the Russian gauge of 5 ft (1.524 metres), and the narrow gauge of 2 ft 6 in (75 cm). The length of lines in April, 1935, totalled 890 miles; of this total 473 miles were broad gauge and 417 miles were narrow gauge. Since 1919 the Estonians have built 255 miles of new lines of both gauges, 362 bridges, and sixty-five stations. The rolling stock comprises 211 steam locomotives, twelve electric and motor locomotives, 489 carriages, and 5,644 wagons. The steam locomotives are almost equally divided between broad and narrow gauges. In the early period of the new Republic the locomotive fuel was either firewood or shale oil in its raw state. Oil shale is still used in a pulverized form for goods engines, but passenger locomotives burn oil produced from the shale. This oil is very economical, and on this account the train fares are claimed to be among the lowest in Europe. Much of the railway equipment was formerly purchased abroad, but it is now being made in the country. traffic. The freight total for 1933-34 was 1,926,000 tons. Timber accounted for nearly half this total, being followed by oil shale, pulp, plywood, fertilizers, and peat. In 1933-34 the railways showed a credit balance and were beginning to pay their way after a few years of depression. As there is no coal in the country the development of the industry of extracting oil from shale has solved the fuel problem of the railways. The development of Estonian railways has proceeded methodically and without interruption since the formation of the Republic. After years of warfare the Estonians were faced with the grim necessity of evolving a modern railway system from the ruins of the old. The story of Estonia is interesting. After vicissitudes including conquest by the German Knights of the Sword, Estonia was under Swedish rule from 1561 to 1710, and under Russian rule from 1710 to 1918. On February 24, 1919, Tallinn, the capital, was freed from Russian Communist troops and independence was proclaimed. A COUNTRY STATION in Estonia, of modern design. The railways of the country suffered greatly during the war of 1914-1918, and considerable reconstruction was necessary. The trains generally stop at all stations. German troops then occupied the country, but after the Armistice of November, 1918, the Germans withdrew. They were followed by invading Russians. A British squadron came to the aid of the Estonians and put an end to attacks by the Russian navy, while the Estonian troops cleared the Russians out of the country. Estonia next had to fight German adventurers under General von der Goltz, who were trying to use the pretext of fighting Bolshevism as an excuse for annexing the Baltic States. The Germans were defeated, an armistice was signed, and a peace treaty was made with Russia on February 2, 1920. At peace after nearly six years of warfare, the Estonians began the work of reconstruction. Tallinn was formerly called Reval. Founded by a Danish king in 1219 and held successively by Danes, Germans, Swedes and Russians, its history is reflected in its architecture. The population in 1935 was over 140,000, the next largest towns being Tartu with 58,600, Narva with 23,200, and Pärnu with 20,700 inhabitants. Tallinn lies on the north coast; Narva, in the east, is near the Russian frontier, and on the broad gauge line to Leningrad. Pärnu lies on the Gulf of Riga. The first railway in the country was built in 1870 between Tallinn and Narva, as part of the Russian Imperial plan to link Tallinn (Reval as it then was) with what was then St. Petersburg and the capital of Russia and is now Leningrad. The distance from Tallinn to Narva is 130 miles on this broad-gauge line Tallinn is a city of steeples and towers, and has railway, sea, and air communications with the rest of Europe. The routes from London are via Harwich, Flushing, Berlin and Riga, via Dover, Calais, Brussels and Berlin, and via Dover, Ostend, Brussels, and Berlin; all the lines pass through the Latvian capital of Riga. The railway station at Tallinn was built by the Russians. On the line to Narva and the Russian border the most important junction is at Tapa (forty-eight miles from Tallinn), where the line from Riga joins it. From Rakvere (sixty-four miles), a branch goes to Kunda on the north coast. Sonda (eighty-one miles) is a junction for a branch to Aseri, likewise on the north coast, and also for a narrow gauge line which goes south to Mustvee. Another branch from Kohtla (ninety-five miles) reaches the coast at Järve. Narva, 130 miles from Tallinn, is an ancient city on the Narva River, with an Estonian castle and a Russian fortress. Above the town the falls of the river provide power for a big cotton and flax spinning factory. In summer steamers go from Narva to the resort of Narva-Jõesuu, at the mouth of the river, about an hour’s journey. Here are miles of sandy beach bordered by pine forests. THE ESTONIAN STATE RAILWAYS have 473 miles of 5 ft gauge track and 417 miles of 2 ft 6 in gauge open. The line between Tallinn antl Haapsalu has a short mileage electrified. The first line in Estonia was opened in 187O between Tallinn and Narva. The city of Tartu lies in the deep valley of the Emajõgi River, which flows from Lake Wõrtsjärv to Lake Peipus, and before the war was known as Dorpat. The buildings cling to the slopes of the river banks, and the green cathedral hill is laid out as a park. The university was founded by Gustavus Adolphus of Sweden in 1632. The river is spanned by bridges. About a mile from the town is the Estonian National Museum at Raadi, which houses paintings and sculpture. Valga, 169 miles from Tallinn, is the frontier station and is known as Valga E. The frontier runs through a house in the town, as stated in the chapter “Stations and Their Story”, which begins on page 758. The railway goes to Valk, or Valga L, on the Latvian side of the border, and on to Riga. This line turns south-west from Tartu. Since the war a new broad-gauge line has been built from Tartu south-east to Petseri (fifty-four miles), which is on the international line from Valga to Pskov, in Russia, the Estonian border town being Irboska, fourteen miles from Petseri. From Petseri to Valga the distance is sixty miles. West of Tallinn a broad-gauge line goes to Paldiski (thirty miles) on the north coast. Keila (seventeen miles) on this line is the junction for the broad-gauge line to Haapsalu and Rohukula, a total length of seventy miles from the capital. Haapsalu, on the west coast and sixty-four miles from Tallinn, is one of the best-known summer resorts on the Baltic because of its mild climate, its beach, and its curative mud. Saaremaa. The mud is a soft pulpy mass bluish grey in colour, and its curative properties are due principally to sulphuric compositions. 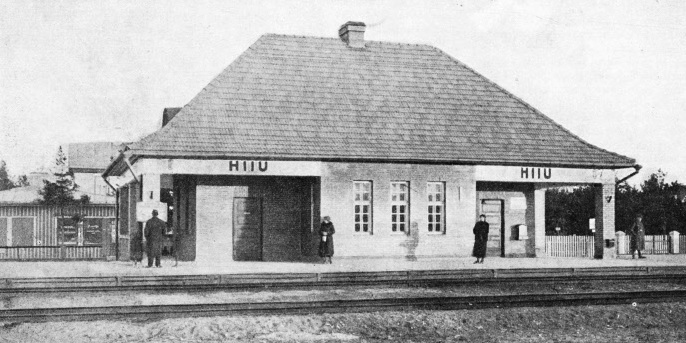 The railways have developed Haapsalu and other resorts by providing an efficient train service. The town has now about 5,000 inhabitants. It was founded in 1228 by the Order of the Knights and contains the ruins of a castle. It is protected from the cold north-east winds by the island of Vormsi and by the Noarootsi peninsula. The water of the sheltered bay often has a temperature of between 70 and 80 degrees F, which is almost that of the ocean in the tropics, and the climate in summer is mild, the temperature varying but little. 72,000 inhabitants, which is linked with Tallinn by a narrow-gauge railway. Pärnu is a model town and an important port. junction for various towns on this system, which serves the country south and south-west of the capital. A new line, sixty miles long, has been constructed from Rapla to Virtsu Sadam, which is on the coast about midway between Haapsalu and Pärnu. The line to Pärnu proceeds past Rapla to Lelle, forty-five miles from the capital and an important junction, and goes south, via Papiniidu, forty-three miles from Lelle. The section from Lelle, being new, has shortened the route by many miles. 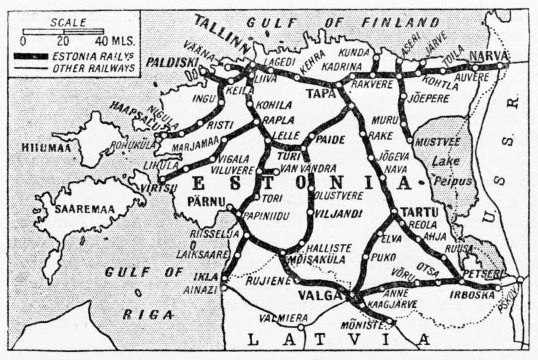 Another line goes east from Lelle to Türi (ten miles) and then north-east to Tamsalu, where it links with the trunk line from Tallinn to Tartu, as stated earlier in this chapter. UP-TO-DATE PASSENGER ROLLING STOCK is to be found in Estonia. This is one of the Diesel-driven rail-cars owned by the State lines. From Türi a narrow-gauge line goes south to Moisaküla (sixty miles), and then north-west to Pärnu (ninety-three miles) connecting at Riisselja (seventy-six miles) with another line, thirty miles long, which goes south-west to the coast at Ikla on the border of Latvia. Easy access to the resorts on the coast, but also serves the farming community inland. falls in this region are very beautiful. The shore below the bank is composed of fine white sand. In the south and south-east the tree-clad hills are divided by deep valleys and chains of lakes. Tallinn is the chief port, as well as the capital of Estonia. Before the war about 14,000 men were employed in the Russian naval yards and in the railway carriage works, but when Estonia became a republic the Russian work ceased. To-day the engineering industry of the country employs about 3,500 workers. Among the chief works are the Government railway shops and those of an engineering firm which makes locomotives, steam engines, farming implements, and factory equipment. The textile industry is important and the largest cotton mill is at Narva. As one-fifth of the country is covered by forests the timber industry employs many hands Coniferous trees are worked up in sawmills and pulp mills, birch is used for plywood and cabinet making, and aspen is made into matches. The bigger saw-mills are in Tallinn, Narva, Pärnu, and Tartu, and boards and boxes are exported; the timber industry accounts for nearly half the goods traffic on the railways. Paper making is one of the oldest industries in the country, one paper mill having existed in Tallinn as early as 1647. Other industries were begun after the war, including those manufacturing chocolate, sweets, biscuits, and cigarettes. 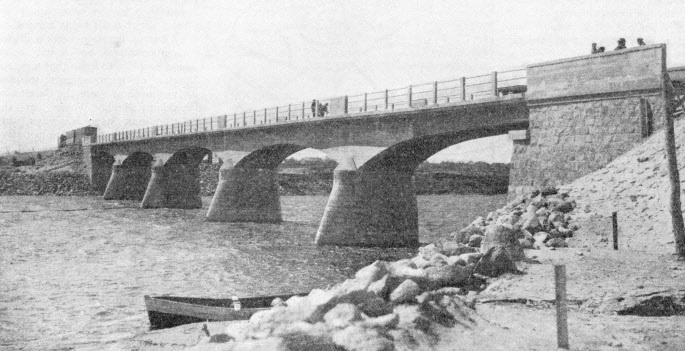 A NEW RAILWAY BRIDGE over the Pärnu River. Since 1919, 362 bridges, sixty-five stations, and 255 miles of new lines have been constructed in Estonia. The new lines are of both broad and narrow gauges. The most important river is the Narva, which flows from Lake Peipus. The Narva and other rivers provide a certain amount of power for factories, about 25,000 horse-power being obtained in this way. A large generating plant is under consideration. With a reserve of water power to generate electricity, and with vast deposits of peat and oil shale, Estonia does not need to import oil or fuel. The export of crude oil is expanding. The policy is to erect power stations on the site of the peat deposits and carry the power across country on high-tension lines. The biggest plant is operated by the State at Ellamaa, thirty-eight miles from Tallinn on the line to Haapsalu. By means of high-tension lines totalling ninety-six miles in length, and with the aid of thirty-eight transforming stations, power and light are supplied to a number of towns and to thousands of farms; this plant produces twenty-two per cent of the total output of the country. The Ulila Power Station is owned by the municipality of Tartu and serves the south-eastern part of Estonia. Only about seven miles of line, between Tallinn and Pääsküla on the Haapsalu railway, are electrified. in the year when the sea is frozen over is forty-five. Though there are few expresses on the Estonian railways, and speed, judged by West European standards, is not high, railway travel is comfortable as well as inexpensive. Most of the trains take second- and third-class passengers. First class is provided on some international trains. Dining and sleeping cars are found on the main routes, and on the narrow gauge lines hot meals are provided at certain stations where the trains make sufficiently lengthy stops. best they could. Bridges were blown up on the retreat in the approved manner, and things made generally as inconvenient as possible for the advancing enemy. A railway system with no rolling stock is awkward; with some of its important civil engineering works blown up, it is still more awkward. But the Russians had a trump card, namely, the break of gauge. In Belgium, as we have seen in the chapter beginning on page 809, the Germans were able to bring in their own great reserves of rolling stock and locomotives to work the railways in the invaded territory. On the Baltic this was at first impossible, as the German stock would not run on the 5 ft gauge lines. There was no alternative to converting the entire system of main lines to standard 4 ft 8½ in gauge. This the Germans, when they occupied the country, succeeded in doing, with the help of their own numerous locomotives and vehicles. The German Eastern Army was able to march into Lithuania and occupy it, merely drawing on that rolling stock which was in such a state of disrepair that the Russians were unable to move it. It was this which gravely hampered Russia in the war; then, as in the earlier war with Japan, her railway and transport system generally gave way completely, while the Germans were past-masters in the use of railways for strategic purposes, and in the art of making something out of nothing. They put the depleted Lithuanian lines to the best possible use, and converted them to standard gauge in what was, perhaps, a record time. The net result of these warlike activities is that to-day, while the Estonian railways are undeniably Russian in origin, those of Lithuania appear to be equally undeniably German. Locomotives and vehicles of the former Prussian State Railways form the mainstay of the rolling stock. The well-known Prussian “P8” class 4-6-0 general service loco-motives, which in their day have been one of the best all-round classes on the Continent, have naturally penetrated to Lithuania. Hundreds of these engines were handed over as reparations to various countries after the war. They may be seen in France, Belgium, and even as far away as Romania and Greece. In spite of this, they still seem to be as numerous as ever in Germany. miles of standard gauge track and 317 miles of narrow-gauge rural light railways. carried out since the war. The majority of the Prussian 4-4-0’s, and all those belonging to the other German railways before the war, were of rather old-fashioned design, and were already becoming outclassed in the rigorous services imposed upon them by the German authorities. imposing. The Lithuanians have found the modern light rail-car an invaluable asset to their secondary passenger traffic on rural and branch lines, and numbers of excellent little Diesel rail-cars with electrical transmission have recently been placed in service. which it is difficult to watch the passing scenery; nevertheless the carriages are comfortable. BUILT FOR LITHUANIA. An unusual 2-4-4 tank locomotive built at Prague by the Skoda works. The Lithuanian State Railways have in operation on their lines some 245 locomotives. Nearly 170 of these are built to the standard gauge. inconvenience of that which remained, for the through Lithuanian line of communications was severed by the “revised” Polish frontier. The break in the railway network was patched up by the construction of the Kazlu-Ruda-Mariampole-Sestokai line, thirty-six miles long. This important southern link joins the capital with the line running eastward through Simnas and Alytus to Varena over the Polish frontier. The Simnas line is also carried in a south-westerly direction to the Polish town of Sowalki. territory did not pass to Lithuania until 1923, and before the construction of the new line, access from the capital was really difficult, necessitating a long and tiresome journey down to the German frontier near Tilsit, on the main line to Berlin and the west of Europe. Lithuania’s capital and its outlet to the sea. The tedious journey, over lines arranged in the form of a letter S is now obviated. The traveller and consignments of goods leave Kaunas in a north-easterly direction as far as Jonavna, from which point the line runs north-west to the important junction of Radviliskis. At this point travellers formerly began the long south-westerly detour almost as far as the east Prussian border before their train again turned north-west to its destination on the Baltic Sea. border through Pandelys and Skapiskis, south of which is the junction. There is a large number of the smaller towns in Lithuania that are not yet served directly by a broad or a narrow gauge line; a road system links these outlying districts with towns along the route, thus enabling produce from the farms spread about the countryside to be marketed in Lithuania’s towns and in the centres of export. The railway system consists of 755 miles of standard gauge railway, together with 317 miles of narrow gauge rural light railways. These lines are operated by some 245 locomotives, of which 169 are on the standard gauge main lines. Of the 422 passenger train vehicles, over 300 are standard gauge, while of goods vehicles there are over 3,900 standard gauge and about 500 narrow-gauge wagons and vans. ON LOCAL ESTONIAN LINES Diesel-driven rail-cars have been introduced by the State Railways Administration. These rail-cars augment the ordinary train services and are capable of fairly high speeds. 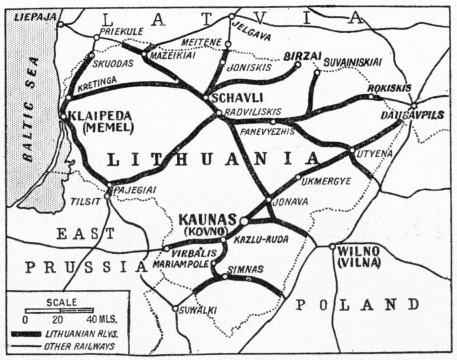 By reason of her uniformity in the matter of rail gauge with Central and Western Europe, Lithuania is much less isolated than Estonia, though she is in a correspondingly bad position where the broad gauge countries are concerned. 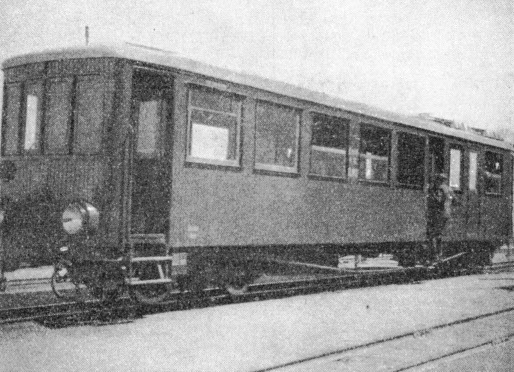 In Eastern Europe, the break of gauge in the Baltic States and all down the Polish frontier is being combated by the use of ingenious design of goods wagon, which can be converted from the 4 ft 8½ in to the 5 ft gauge within a short space of time. Such vehicles are owned by the German, Polish, and Russian railways, as well as by those operating in the three Baltic states. In the old days of the Great Western broad gauge in England, the difference was too great to allow for anything of this kind to be evolved in a practical form even had it occurred to anyone. In Lithuania the best trains run at night. After all, slowness on a night train has its compensations over relatively short distances, for it often means that the passenger leaves the train at a fairly comfortable hour in the morning instead of in the small hours. The night express from Kaunas to Riga arrives at Riga at ten minutes to seven in the morning, having left the Lithuanian capital at ten o’clock the previous night. This is not particularly fast running for a distance of only 183 miles; but, for a night journey at least, it has its good points. The express is a sleeping car train carrying first-, second-, and third- class passengers. Kaunas is 517 miles from Berlin, and the journey takes about thirteen hours by the through sleeping-car express. The Berlin-Kaunas run, which is quite creditable considering the fact that three frontiers have to be crossed, occupies a day; the train spends the rest of the night reaching Riga in the manner just described. It is only fair to add that by far the fastest running is that behind the German State Railway locomotives through the Polish Corridor and East Prussia. The importance of the railways to the Lithuanian can hardly be exaggerated, particularly of the lines leading to Memel, the country’s outlet to the Baltic Sea. Through Memel passes a large part of the Republic’s chief exports, which are bacon, dairy produce, cellulose, timber, flax and livestock. Through Memel also there is a large volume of imports, food, mainly herrings, clothing in the form of textile goods, and large quantities of machinery. Many kinds of raw materials also supply traffic to the railways leading inland from Memel; coal, cement and metals form the bulk of these imports. Kaunas, or Kovno, is an important centre of Lithuania’s railway system. “Grande Armée”, which, on June 23, 1812, reached the left bank of the Niemen opposite the city. A hill near a neighbouring village is still known as “Napoleon’s Hill”. The railways of these Baltic countries are not spectacular in the matter of speed and ultra-modernity of equipment; but such things are in the nature of luxuries enjoyed by the larger and more powerful industrialized countries such as Great Britain, France, and Germany. ln their limited sphere the Baltic railways do their work well and efficiently. Instead, therefore, of making invidious comparisons between them and the big systems of Western Europe, we should rather applaud, and indeed wonder at, the magnificent way in which their respective administrations have evolved complete order out of the chaos caused by the Russian retreat, the pre-war Russian methods, and the sad disintegration caused by war conditions. To evolve complete national railway systems out of the cast-off strategic railways of Tsarist Russia was a task difficult of accomplishment. THE INTERNATIONAL SLEEPING CAR COMPANY provides stock on certain of the international trains. On the broad gauge lines there are some 280 carriages in operation, and on the narrow gauge, 139. Above is a typical excursion train in southern Estonia. You can read more on “Poland’s Main Lines”, “Russia and Siberia” and “The State Lines of Latvia” on this website.